Founded in 1996, DuMOL is a vineyard focused producer of cool-climate Pinot Noir and Chardonnay from distinctive vineyards in the extreme southwestern part of the Russian River Valley. 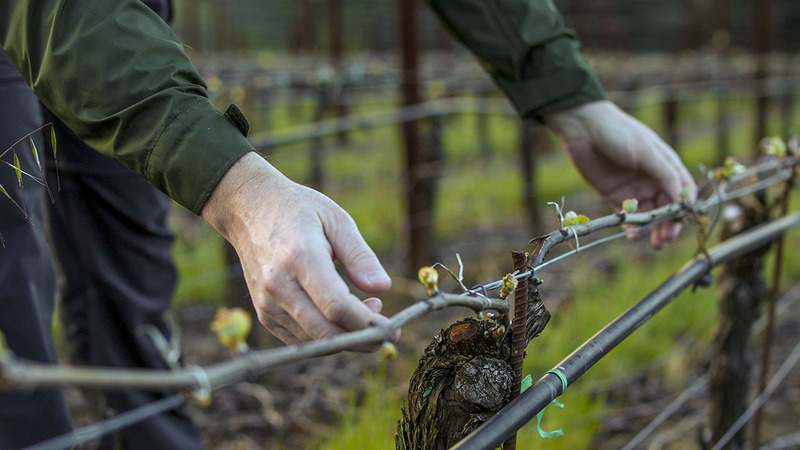 We also grow and craft small-lot Syrah, Cabernet Sauvignon, and Viognier from exceptional vineyard sites in Sonoma and Napa, expanding twenty years of winegrowing experience. Through precise attention to detail in the vineyards and vintage-specific winegrowing and winemaking, we aim to create wines that highlight the purity of place. Our small team is dedicated to our portfolio of Estate, leased, and grower-partner vineyards. DuMOL wines are released through limited allocations to our consumer mailing list and select restaurants worldwide. We live the wine. It’s not just a vocation. It’s very much who we are. Both livelihood and passion. It’s what gets us up in the morning. This is a project that comes from who we are and what we love. There’s tremendous personal satisfaction in creating wines that inspire contemplation – and we are encouraged by the feedback our efforts have garnered. What sets Smith apart from his winemaking peers is his vineyard experience and his relentless experimentation to achieve perfection. I am not going out on a limb by saying that this is an extraordinary new lineup by DuMOL. It is hard to find a winery that provides the depth of lineup that DuMOL exudes. Producing lots of small lots of wines from a small selection of different grape varieties (Pinot Noir, Chardonnay, Cabernet Sauvignon, Viognier and Syrah)—the standard of quality and expression of site is phenomenally consistent at DuMOL with too many great new releases to recommend individually. What’s more, the prices for the quality (most wines are $60-$80 per bottle on mailing list release) will blow you away. This is one mailing list you don’t want to miss being on. As viticulturalist and winemaker . . . [Andy Smith's] style has evolved from richer wines to subtler lighter styles. His range is superb, I particularly enjoyed DuMOL Pinot Noir 2009 from his Coffee Lane vineyard. By 2003 when the winery began planting their own estate vineyard in the Russian River Valley known as Green Valley, Smith made the decision to establish a vineyard in a manner that would support greater freshness but also more nuance in the wines. How to be the perfect host(ess)? My plan had been to serve a California Chardonnay from the cool Sonoma Coast – made, incidentally, by a Scottish winemaker – DuMOL's Isobel Chardonnay 2013. Andy Smith has been the viticulturalist and winemaker at DuMOL for 20 years. His crafting of the Chardonnays and Pinots has edged notably towards a more elegant and refined style over the years. My tasting at DuMOL was one of the highlights of my January trip to Sonoma…2016 and 2015 are fabulous back to back vintages at DuMOL. This range is seriously impressive. An unusually refined marriage between the glorious ripeness and sweetness of fruit from California, and the restraint and finesses one might expect from a classic European region. Andy Smith once swam competitively for Scotland; now he’s making Napa Valley wines drunk by royalty and presidents. Smith has agreed to spend the day driving me through DuMOL vineyards. We’re discussing the region but also his evolution as a winemaker.